As the risk-on rally resumes in European stocks, a pillar of the market is facing some of its worst losses since the Brexit vote. They’re called value stocks, considered cheap and spanning industries from financials to materials and health-care stocks. They are beloved by quants -- and their comedown could be a bellwether for the state of the European economic cycle. The thinking goes that value stocks do best during expansionary phases of the economy, when strong corporate profits will lift even the most chronically underpriced shares. 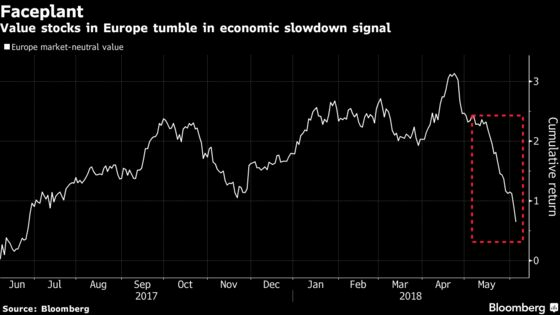 Instead, since the end of April, investors in Europe have been chucking value shares to seek shelter in so-called quality names that could better weather an economic downturn. While inflation and jobs data have been strengthening, there are enough signs of weakness to support a bear’s case against value stocks. On Thursday, a reading of euro-area exports fell for the first time in five years, while German factory data declined to the worst level since September 2011. Europe had been the perennial value play for overseas investors concerned about frothy prices in other developed markets. Seeking out cheap stocks has been a dismal strategy in the U.S. for much of the bull market, as growth-heavy tech stocks carry equities higher. But the appeal of Europe in general may be waning amid political drama in southern Europe. Funds focused on the single market have been bleeding assets while Wall Street strategists recommend pivoting to the S&P 500. Over the past year, a long-short version of value has declined 7.9 percent -- the worst of the 17 most-common factors tracked by Bloomberg. Over the past 20 days, the factor has seen its biggest slump in two years. Yet, slowing economic growth may not be the driving force. An aged bull market is more susceptible to shocks that send investors fleeing from value shares and increases volatility within investing styles, according to Jason Williams, a portfolio manager at Lazard Asset Management Ltd. Indeed, judging by earnings to price ratios, Italian banking stocks like Banco BPM SpA and BPER Banca top the value list. The former has fallen 21 percent in the past month, while BPER has declined 8.8 percent over the same period. Still, Europe isn’t the only developed market struggling to keep value shares afloat. They’re lagging in the U.S. and Japan as well, demonstrating the extent to which fears of slowing synchronized global growth are preying on investors, said JPMorgan’s Khuram.